An enthralling book that not only satisfies our fascination for lost wisdom of our ancestors but also indulges the British obsession with the weather. Probably the best known country saying of them all is 'red sky at night, shepherd's delight'. 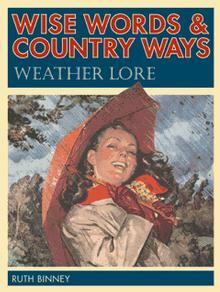 Wise Words and Country Ways Weather Lore presents us with dozens more similar, but largely now forgotten, words of wisdom that are imbued with a centuries-old understanding of the patterns of British weather, seasonal changes and the behaviour of plants and animals around us. It has highly relevant content for an age where we all feel we have lost touch with the patterns of nature.